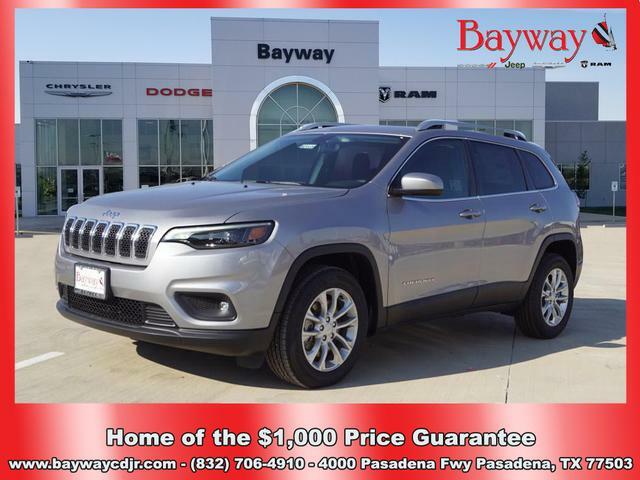 * 2019 ** Jeep * * Cherokee * * Latitude * For a smoother ride, opt for this 2019 Jeep Cherokee Latitude with a backup camera, Bluetooth, braking assist, a power outlet, hill start assist, stability control, traction control, anti-lock brakes, dual airbags, and side air bag system. The exterior is a beautiful white. This one's a keeper. It has a crash test safety rating of 4 out of 5 stars. Interested? Call today and schedule a test drive! Contact Information: Bayway Chrysler Dodge Jeep Ram, 4000 Pasadena Highway, Pasadena, TX, 77503, Phone: (713) 433-4000, E-mail: internetleads1660@car-crm.com. 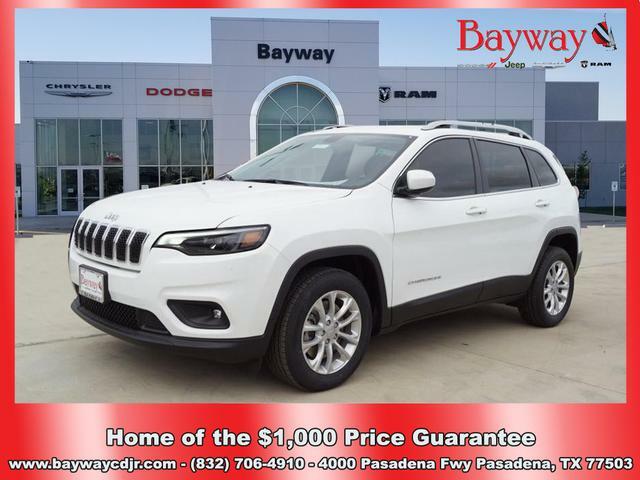 * 2019 ** Jeep * * Cherokee * * Latitude * With top features including the backup camera, Bluetooth, braking assist, a power outlet, hill start assist, stability control, traction control, anti-lock brakes, dual airbags, and side air bag system, this 2019 Jeep Cherokee Latitude is a great decision. The exterior is a sleek billet silver metallic clearcoat. This one's a keeper. It has a crash test safety rating of 4 out of 5 stars. Call or visit to talk with one of our vehicle specialists today! Contact Information: Bayway Chrysler Dodge Jeep Ram, 4000 Pasadena Highway, Pasadena, TX, 77503, Phone: (713) 433-4000, E-mail: internetleads1660@car-crm.com. 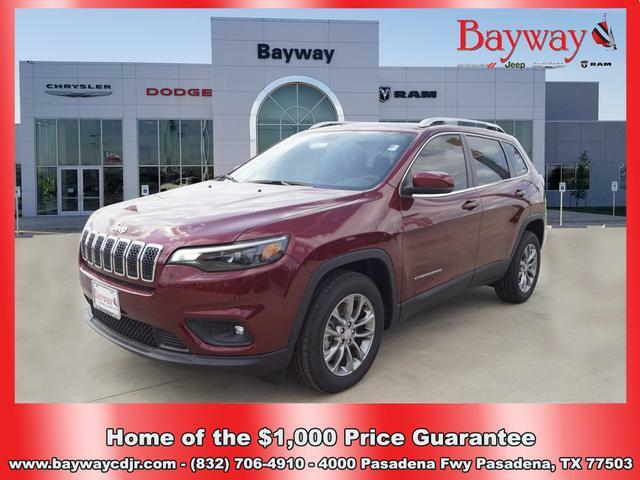 * 2019 ** Jeep * * Cherokee * * Latitude * Featuring a backup camera, Bluetooth, braking assist, a power outlet, hill start assist, stability control, traction control, anti-lock brakes, dual airbags, and side air bag system, be sure to take a look at this 2019 Jeep Cherokee Latitude before it's gone. The exterior is a ravishing diamond black crystal pearlcoat. Don't skimp on safety. Rest easy with a 4 out of 5 star crash test rating. Interested? Don't let it slip away! Call today for a test drive. Contact Information: Bayway Chrysler Dodge Jeep Ram, 4000 Pasadena Highway, Pasadena, TX, 77503, Phone: (713) 433-4000, E-mail: internetleads1660@car-crm.com. 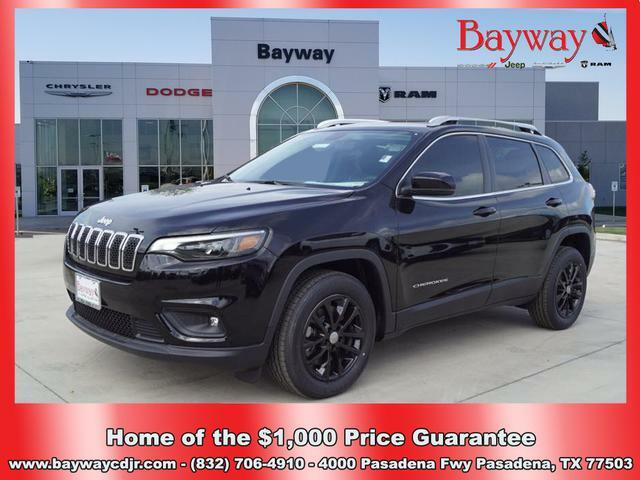 * 2019 ** Jeep * * Cherokee * * Latitude * This 2019 Jeep Cherokee Latitude includes a backup camera, Bluetooth, braking assist, a power outlet, hill start assist, stability control, traction control, anti-lock brakes, dual airbags, and side air bag system and is a car that deserves some serious attention. The exterior is a sharp diamond black crystal pearlcoat. With a 4-star crash test rating, this is one of the safest vehicles you can buy. Interested? Don't let it slip away! Call today for a test drive. Contact Information: Bayway Chrysler Dodge Jeep Ram, 4000 Pasadena Highway, Pasadena, TX, 77503, Phone: (713) 433-4000, E-mail: internetleads1660@car-crm.com. 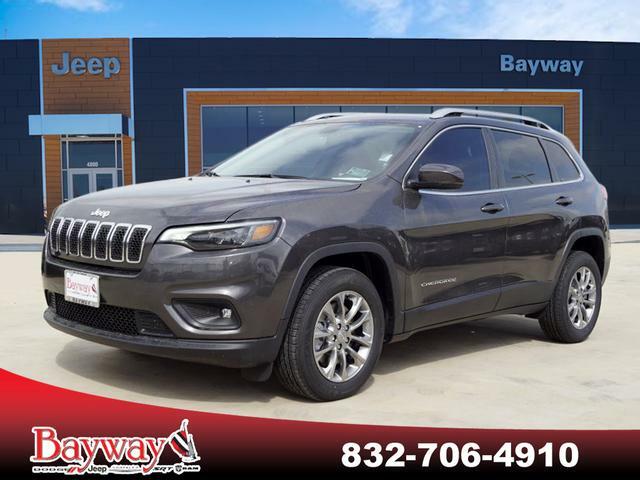 * 2019 ** Jeep * * Cherokee * * Latitude * For a smoother ride, opt for this 2019 Jeep Cherokee Latitude with a backup camera, Bluetooth, braking assist, a power outlet, hill start assist, stability control, traction control, anti-lock brakes, dual airbags, and side air bag system. The exterior is a ravishing bright white clearcoat. Want a SUV you can rely on? This one has a crash test rating of 4 out of 5 stars! Interested? Call today and take it for a spin! Contact Information: Bayway Chrysler Dodge Jeep Ram, 4000 Pasadena Highway, Pasadena, TX, 77503, Phone: (713) 433-4000, E-mail: internetleads1660@car-crm.com. 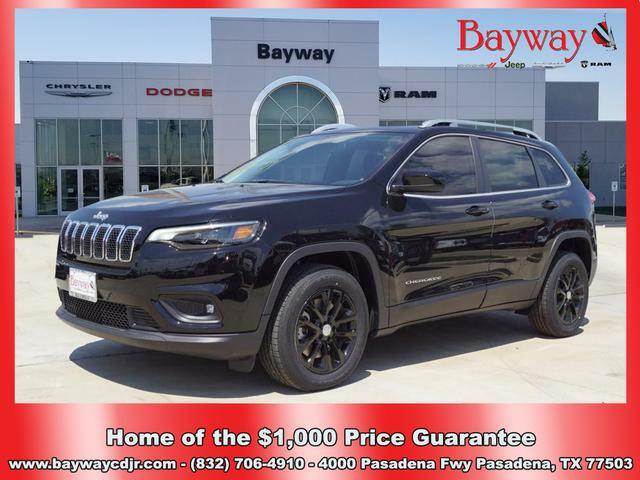 * 2019 ** Jeep * * Cherokee * * Latitude * If you're looking for a smooth ride, look no further than this 2019 Jeep Cherokee Latitude with a backup camera, Bluetooth, braking assist, a power outlet, hill start assist, stability control, traction control, anti-lock brakes, dual airbags, and side air bag system. The exterior is a gorgeous bright white clearcoat. This safe and reliable SUV has a crash test rating of 4 out of 5 stars! Don't wait until it is too late! Call today to schedule an appointment. Contact Information: Bayway Chrysler Dodge Jeep Ram, 4000 Pasadena Highway, Pasadena, TX, 77503, Phone: (713) 433-4000, E-mail: internetleads1660@car-crm.com. 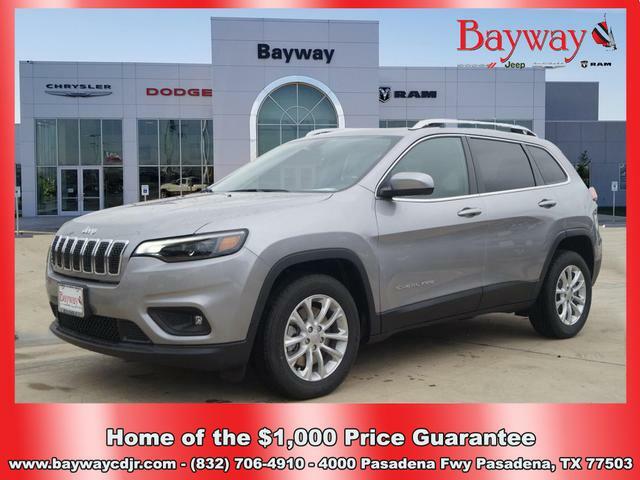 * 2019 ** Jeep * * Cherokee * * Latitude * This 2019 Jeep Cherokee Latitude is a real winner with features like a backup camera, Bluetooth, braking assist, a power outlet, hill start assist, stability control, traction control, anti-lock brakes, dual airbags, and side air bag system. The exterior is a charming velvet red pearlcoat. With a 4-star crash test rating, this is one of the safest vehicles you can buy. Call or visit to talk with one of our vehicle specialists today! Contact Information: Bayway Chrysler Dodge Jeep Ram, 4000 Pasadena Highway, Pasadena, TX, 77503, Phone: (713) 433-4000, E-mail: internetleads1660@car-crm.com. 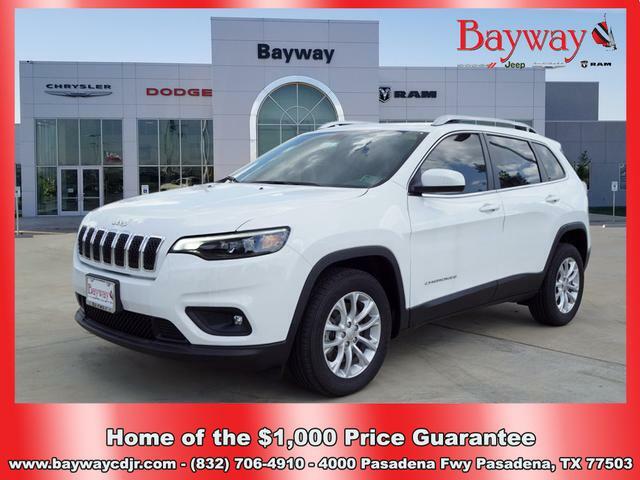 * 2019 ** Jeep * * Cherokee * * Latitude * For a top driving experience, check out this 2019 Jeep Cherokee Latitude with a backup camera, Bluetooth, braking assist, a power outlet, hill start assist, stability control, traction control, anti-lock brakes, dual airbags, and side air bag system. The exterior is a ravishing diamond black crystal pearlcoat. With a crash test rating of 4 out of 5 stars, everyone can feel secure. This is the vehicle you have been waiting for! Call now to schedule a test drive! Contact Information: Bayway Chrysler Dodge Jeep Ram, 4000 Pasadena Highway, Pasadena, TX, 77503, Phone: (713) 433-4000, E-mail: internetleads1660@car-crm.com. 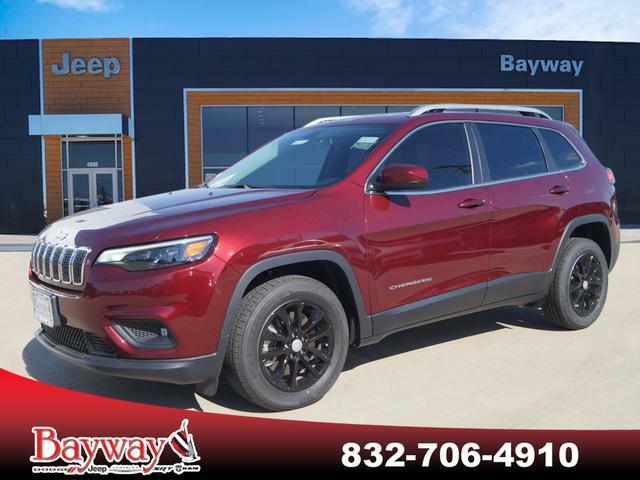 * 2019 ** Jeep * * Cherokee * * Latitude * The backup camera, Bluetooth, braking assist, a power outlet, hill start assist, stability control, traction control, anti-lock brakes, dual airbags, and side air bag system of this 2019 Jeep Cherokee Latitude make this vehicle a true standout. The exterior is a classic bright white clearcoat. This SUV scored a crash test safety rating of 4 out of 5 stars. Come see us today and see this one in person! Contact Information: Bayway Chrysler Dodge Jeep Ram, 4000 Pasadena Highway, Pasadena, TX, 77503, Phone: (713) 433-4000, E-mail: internetleads1660@car-crm.com. 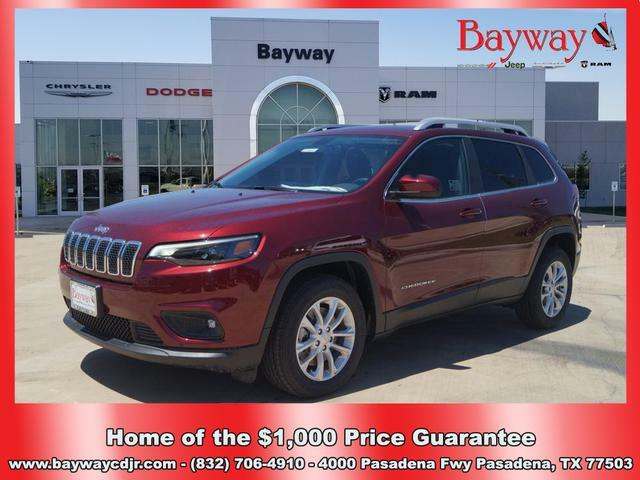 * 2019 ** Jeep * * Cherokee * * Latitude * With features like backup camera, Bluetooth, braking assist, a power outlet, hill start assist, stability control, traction control, anti-lock brakes, dual airbags, and side air bag system, this 2019 Jeep Cherokee Latitude is a must-have ride. The exterior is a charming billet silver metallic clearcoat. Looking to buy a safer SUV? Look no further! This one passed the crash test with 4 out of 5 stars. Interested? Call today and take it for a spin! Contact Information: Bayway Chrysler Dodge Jeep Ram, 4000 Pasadena Highway, Pasadena, TX, 77503, Phone: (713) 433-4000, E-mail: internetleads1660@car-crm.com. 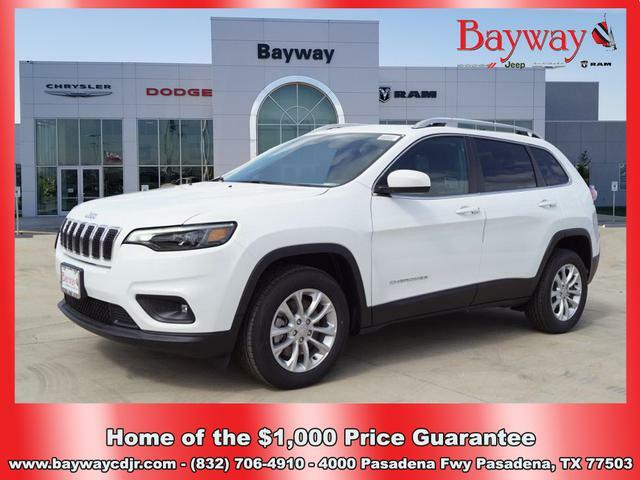 * 2019 ** Jeep * * Cherokee * * Latitude * Auto fans love the backup camera, Bluetooth, braking assist, a power outlet, hill start assist, stability control, traction control, anti-lock brakes, dual airbags, and side air bag system of this 2019 Jeep Cherokee Latitude. The exterior is a timeless velvet red pearlcoat. Stay safe with this SUV's 4 out of 5 star crash test rating. This is the vehicle for you! Give us a call today and don't let it slip away! Contact Information: Bayway Chrysler Dodge Jeep Ram, 4000 Pasadena Highway, Pasadena, TX, 77503, Phone: (713) 433-4000, E-mail: internetleads1660@car-crm.com. 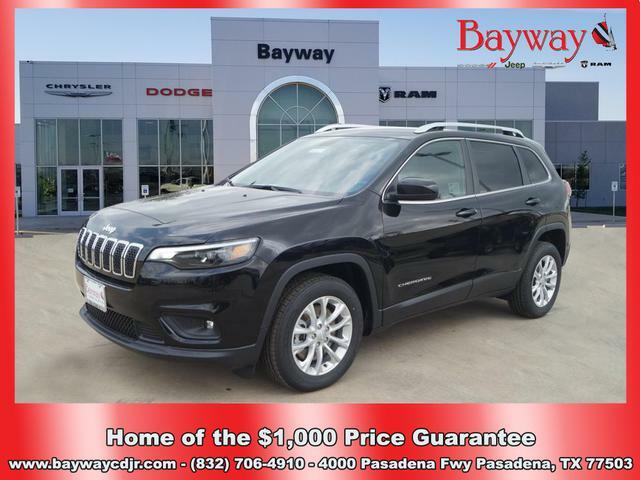 * 2019 ** Jeep * * Cherokee * * Latitude Plus * This 2019 Jeep Cherokee Latitude Plus features a push button start, backup camera, Bluetooth, braking assist, a power outlet, hill start assist, stability control, traction control, anti-lock brakes, and dual airbags and may just be the car you've been waiting for. The exterior is a beautiful granite crystal clearcoat metallic. With a crash test rating of 4 out of 5 stars, everyone can feel secure. Interested? Call today and schedule a test drive! Contact Information: Bayway Chrysler Dodge Jeep Ram, 4000 Pasadena Highway, Pasadena, TX, 77503, Phone: (713) 433-4000, E-mail: internetleads1660@car-crm.com. 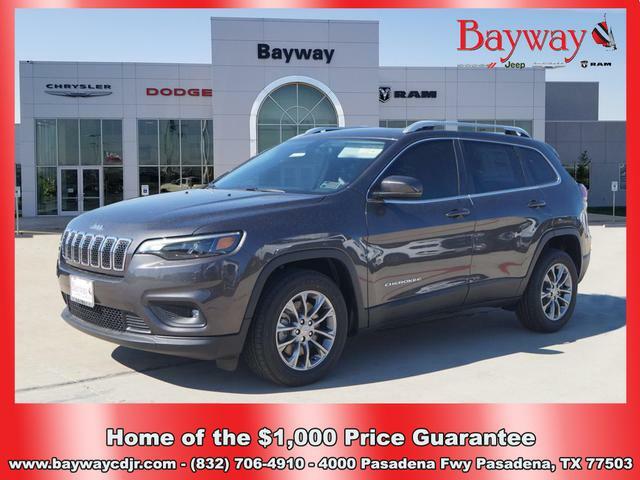 * 2019 ** Jeep * * Cherokee * * Latitude Plus * Make sure to get your hands on this 2019 Jeep Cherokee Latitude Plus with a push button start, backup camera, Bluetooth, braking assist, a power outlet, hill start assist, stability control, traction control, anti-lock brakes, and dual airbags before it's too late! The exterior is a dazzling diamond black crystal pearlcoat. With an unbeatable 4-star crash test rating, this SUV puts safety first. Interested? Call today and schedule a test drive! Contact Information: Bayway Chrysler Dodge Jeep Ram, 4000 Pasadena Highway, Pasadena, TX, 77503, Phone: (713) 433-4000, E-mail: internetleads1660@car-crm.com. 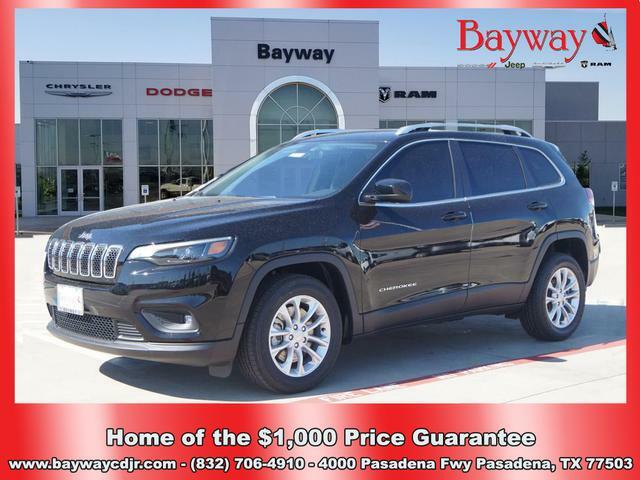 * 2019 ** Jeep * * Cherokee * * Latitude Plus * Get ready to go for a ride in this 2019 Jeep Cherokee Latitude Plus, which comes equipped with a push button start, backup camera, Bluetooth, braking assist, a power outlet, hill start assist, stability control, traction control, anti-lock brakes, and dual airbags. The exterior is a timeless granite crystal clearcoat metallic. This safe and reliable SUV has a crash test rating of 4 out of 5 stars! View this beauty and our entire inventory today! Call for more details. Contact Information: Bayway Chrysler Dodge Jeep Ram, 4000 Pasadena Highway, Pasadena, TX, 77503, Phone: (713) 433-4000, E-mail: internetleads1660@car-crm.com. 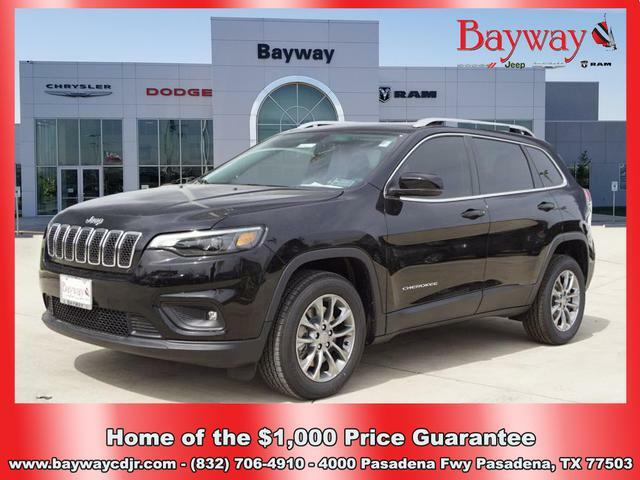 * 2019 ** Jeep * * Cherokee * * Latitude Plus * For a smoother ride, opt for this 2019 Jeep Cherokee Latitude Plus with a push button start, backup camera, Bluetooth, braking assist, a power outlet, hill start assist, stability control, traction control, anti-lock brakes, and dual airbags. The exterior is a dazzling diamond black crystal pearlcoat. You can trust this SUV because it has a crash test rating of 4 out of 5 stars! Interested? Call today to take this vehicle for a spin! Contact Information: Bayway Chrysler Dodge Jeep Ram, 4000 Pasadena Highway, Pasadena, TX, 77503, Phone: (713) 433-4000, E-mail: internetleads1660@car-crm.com.